Hey, i dropped an hour around here somewhere, and i can't seem to find it. The computer says it's about a quarter to seven, but the microwave says it's about a quarter to six. The microwave can't be wrong, right? So . . . has anyone seen an hour laying around they can't account for? [+3] - ehBeth - 03/14/2010CVS in Salem. My first Lemonhead dealer. Serious **** mon. i think we have it down here. we are keeping it hostage until the end of march then you can have it back again... slightly soiled. Give me a minute and I'll help you look. Oh! There's that extra one I found last fall. Question why is there a daylight savings time anyway. I've heard it's for the children--so they won't have to ride the busses in the dark--which personnally makes the case for delaying the schools an hour-not for daylight savings. I've also heard it's for the farmers--as if corn really cares what time the su comes up. Finally, and the most believable to me, it's for the golf courses--it seems an extra hour at the end of a day allows some people to get in nine. Nevertheless, I could be, and probably am, wrong. But I'm still curious---why do we have daylight savings time---BTW I was a teenager in one of Indiana's eleven counties that does not have daylight savings--I don't think I missed anything; however, I don't play golf. Here, it's a quarter to 11.00. Do kids still "get" quarter hours? I woke up at what felt like about 3:30 AM or so. RP's clock said 4:20. Mine said 3:40. I took 2 Tylenol and returned to bed. I have no idea when my next dosage is. I'll tell ya what . . . we'll split the difference . . . you send us 30 minutes back. Then in the autumn, we'll add subtract half an hour, and stop screwing with the clocks. I think i'm a-gonna go back to bed, too . . . it's more than i can handle . . .
Oh dear!! 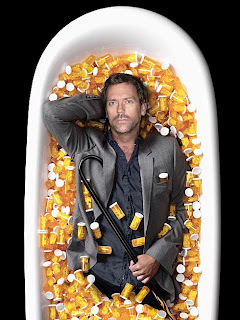 You must be suffering from Dr. House Syndrome! Popping them pills like a mad lady!! Yes, it's true. I take 2 Tylenol every four hours (or so ... today is ... off) for pain. I'd buy them on the street but the local CVS is so much cleaner. CVS in Salem. My first Lemonhead dealer. The 30 mins we have spare is at night time. Your missing hour is in the morning. What's your beef? You get an extra 30 minutes in the night time, and we take a half hour outta the morning . . . it's a win-win situation. Idiot! We have to give you back 30 mins of dark. You need 30 mins of light. Uhm, it was dark out when i lost that hour . . . if we get 30 minutes of dark back, no problem . . .
Not sure why it started; but congress changed DST a few years ago to supposedly help reduce electricity needs. Apparently, the extra hour of sunlight in the evening, when most people are home, reduces the need to turn on the electric lights. I don't think the hour of electric light gets shifted to the morning. I know once I wake up, the only light that goes on is the bathroom light (which would go on regardless of time of day because there are no windows). The rest of the house is dark. So; hope that helps. For more history I'm sure you can google it. » Lost and . . . found?